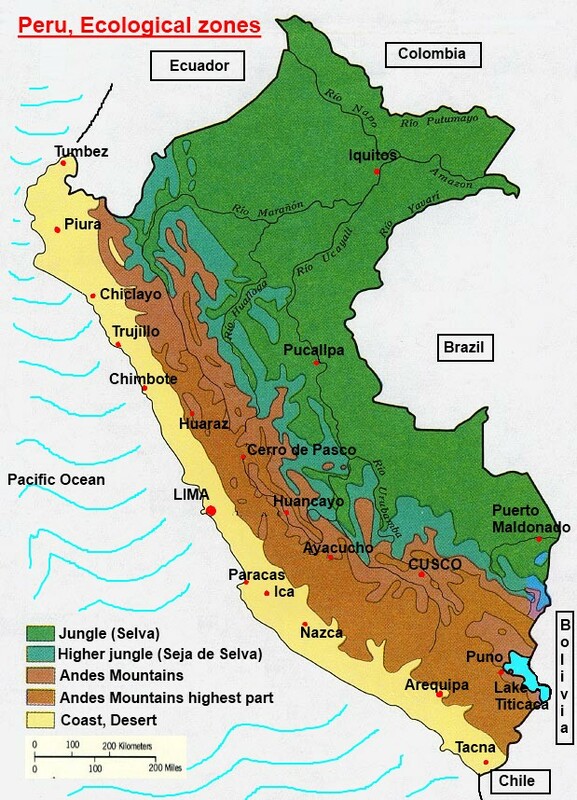 This Peru Climate section gives you an idea about the various climate zones in Peru. 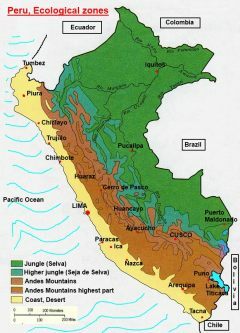 Roughly Peru can be divided in 3 big climate zones, namely almost the whole Pacific Coast wich forms a long and thin desertic zone between the ocean and the Andean mountains, then we have the Andes Montains themselves, also called "Sierra", and the Jungle towards Brasil, which forms part of the Amazon region. See also our map of the ecological zones. This division in 3 zones shows the great variety in the weather. La Costa, or coast, is almost the whole year dry, but can be cloudy in the summer (from May to October), in many parts formning an almost permanent fog called "garua". The "Sierra", or andean mountains, has also a division between the dry season and the rainy season. Rainy from November to March and dry from April to October. Temperatures during 24 hours can vary greatly, especially in the dry season, when at nigth temperatures on the higher altitudes can go down below zero, and at midday the sun can burn strongly. The Selva or Jungle has the same division between rainy and dry season as the Mouuntians, but with high temperatures and a typical rainforest climate. Of course there are different gradations between the Selva and mountians and between the coast and the mountains, depending on the alititude. The climate of the coast ranges from warm and semiarid close to Ecuador in the North (relatively close to the equator), to a climate where the winter is cool, cloudy and humid, but without much rainfall. Especially the influence of the cold Humboldt Current is important here. The northern coast's temperature extremes range from 14 to 38 Celsius (57.2 to 100.4 Fahrenheit). Summers are hot, humid and sunny, with rare afternoon and nocturnal rainshowers. More to the north it becomes less arid, due to the Humboldt Current getting less cold as it nears the Equator. In that way the Tumbes Region that borders Ecuador, is the only coastal one with regular seasonal precipitation. Summer rainfall totals rarely exceed 200 mm (7.9 in), except in the case of severe El Niño events, which can provoke major floodings and precipitations that can be as high as 4,000 mm (157.5 in). Winter is characterized by warm yet comfortable conditions and absence of rain. Central and southern coast are cooler, Tumbes and Piura regions are warmer. We have here the best beaches of the country that can be visited the whole year; sun almost all year long (300 sunny days average annually), nice temperatures without humidity. In the central and southern coasts, more or less from Chiclayo southwards, temperature ranges from 8 to 29 °C (46.4 to 84.2 Fahrenheit). Rainfall is scarce, annual totals are not more than 150 mm.. Summer is warm, moist and sunny conditions with lows between 18 and 22 Celsius (64.4 and 71.6 Fahrenheit) and highs between 24 and 29 Celsius (75.2 and 84.2 Fahrenheit). Temperatures over 29 Celsius (84 Fahrenheit) are commonly observed less than 10 days per year except at the Ica deserts where summer highs can sometimes reach 35 Celsius (95 Fahrenheit). Little or no rainfall occurs during the summer. Summer rainfall totals are generally less than 10 mm (0.4 in). Winter is cool and with damp conditions, keeping daytime temperatures cool, and is determined by an almost permanent layer of fog, which sometimes creates "garua", a sort of very fine drizzle. The so-called 'rainy season' goes from late May to mid October. Precipitation is between 10 and 150 mm (0.4 and 5.9 in). Temperatures are from 14–18 Celsius (57.2–64.4 Fahrenheit) at night and 19–21 Celsius (66.2–69.8 Fahrenheit) during the day. Winter maximum is between 15 and 21 Celsius (59 and 69.8 Fahrenheit) and the lows between 8 and 15 Celsius (46.4 and 59 Fahrenheit). One of the reasons that the famous Nazca lines did not disappear with time, is that this region is extremely dry, despite of the grey skies in winter, and windless. This dessert is one of the driest places on earth. The Peruvian Andes or Sierra has the largest diversity in climate of the country. Temperature depends greatly on the altitude of course, varying from temperate (annual average of 18 Celsius / 64 Fahrenheit) in the low-lying valleys to very cold (annual average below 0 Celsius / 32 Fahrenheit) in the highest elevations. The maximum temperature is often steady throughout the year, the low varying due to the presence of clouds in the rainy season, which help keeping the daytime heat during the night. In the absence of clouds, nights are much colder, this especially happens in june and July. Precipitation varies in different scales and has a marked seasonality. The rainy season starts in September and has peaks between January and March, whereas the May–August period is dry and with cold nights and mornings. There is a marked southwest-northeast rainfall gradient with the driest conditions (200–500 mm/7.9–19.7 in/year) along the southwestern Andes, and the wettest conditions along the eastern slopes (>1,000 mm/39.4 in/year). Some regions immediately east of the Andes can receive as much as 10,000 mm (393.7 in)/year. Occasionally thunderstorms can be accompanied by heavy lightning, strong winds and damaging hail, especially at the beginning of the rainy season and over higher elevations. Snowfall is frequent above 5,000 m (16,404 ft) during the rainy season, and occasional above 3,800 m (12,467 ft) between May and August. This region is dominated by the Equatorial climate typical for the Amazon Rainforest. Most of the time the climate is hot and rainy. Temperatures are between 18-36 Celsius (64.4–96.8 Fahrenheit) and rainfall between 1,000 and 4,000 mm (39.4 and 157.5 in) per year. The Central and Southern part of the peruvian jungle have a short dry season between June and August. Sometimes some cold occurs due to weather influences coming in from Argentina, which may lower the temperature to 10–15 Celsius (50–59 Fahrenheit). This occur 1–5 times per year between May and September.